If you’re a regular reader, you’ll know that I’ve been on the road for the past three weeks, and have enjoyed some quality radio time in New Mexico and Colorado. While I brought four portables along (the CommRadio CR-1, the Sony ICF-SW7600GR, the Tecsun PL-380, and the Tecsun R1212A), when conditions were favorable and I wanted to chase a little DX, I chose the CommRadio CR-1. I’ve sung the praises of the CR-1 as a great travel radio in the past, when it accompanied me on several shorter trips, but this particular road trip afforded me some quality time with this little rig. What makes the CR-1 such a great radio for travel? One con of the CR-1 is that its front panel function buttons are not backlit. Fortunately, there are only six buttons, so it was easy to commit them to memory: I did so much outdoor nighttime listening, I can now operate the CR-1 in the dark. Although the CR-1 is basically a tabletop SDR, it reminds me very much of the Palstar R30C I once owned and Lowe receivers I’ve used in the past–simple and effective. The photo at the top of the post was taken in the back garden of a friends’ home in Taos, NM. Though you can’t see this in the photo, it was hooked up to a Par Electronics EF-SWL wire antenna at the time. It took five or so minutes to hang the EF-SWL in a tree, but took me only a few seconds to pull the CR-1 from a small flight case, plug in the antenna, and have it on the air. I charged the CR-1 prior to the trip so I didn’t even need a power supply. In fact, the internal battery powers the CR-1 long enough, I only charged it perhaps twice on the whole trip. A flight case I purchased for $3 at a charity store holds the CR-1, the Sony ICF-SW7600GR and the Tecsun PL-380. 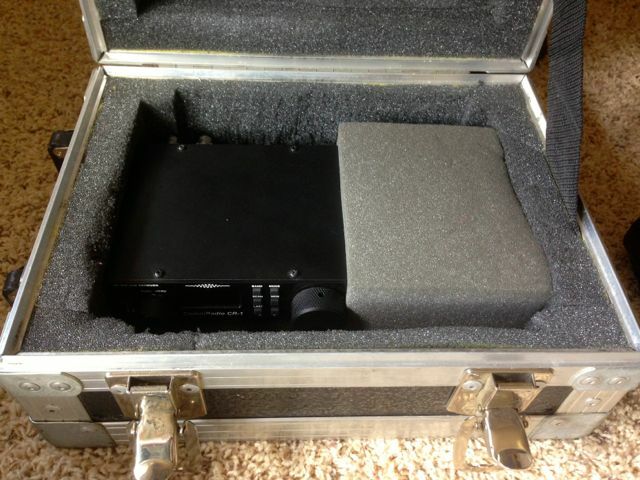 This case is fairly bullet-proof, protecting the contents even if dropped or heavy items are placed on it. CommRadio recently introduced the CR-1a, identical to the CR-1 in every respect but with the addition of a USB I/Q output, making it a very capable SDR when connected to a PC–and simplifying the update process to one step (the CR-1 requires two steps). In conclusion? My appreciation for this rig has grown. If you’re searching for a capable travel receiver, certainly consider adding the CommRadio CR-1 or the CR-1a to your list of considerations. This entry was posted in News, Shortwave Radio, Software Defined Radio, Travel and tagged CommRadio, CommRadio CR-1, CommRadio CR-1 Review, CommRadio CR-1a, CR-1, CR-1a, Shortwave Radio Travel, Shortwave Travel on September 8, 2014 by Thomas. I am in the process of getting a CR-1a. What type of whip antenna is the best to use with this radio? I know it is not designed to be used with such an antenna, but I still would like to to know? I mostly want to hear ham and sw.
A small update to my review of the CommRadio. I am pleased with the results that I am getting but operating the radio is non too clever. The buttons are tiny and too close to the main tuning knob, the main problem however is the logic, or rather the lack of it. It can be a frustrating little beast to use. Now, on a different note, is anyone using the AOR AR-DV1 ? My Comm Radio arrived today and I have been very busy getting use to it. Firstly lets shift the not so good aspects of it out of the way. It is well known that the FM broadcast band is not too sensitive. UK users do not get the 70cms band, the lowest frequency is well above our band. The suggested power supply / charger turned out to be a nasty switched mode noise generator, I really must get a decent linear supply. Now to the hf bands, broadcast and amateur, and so far I am delighted with it ! I have been away from radio for many years and returned recently with a Tecsun PL-880. Despite many years of using radios in the past the Comm Radio has rather surprised me, it will take a while to get use to the controls. Using the volume control to adjust various functions, well, that is a new one for me ! I found some controls a little strange at first but now I really like the software. I said “software”, how odd for me, when I started in radio the word “software” was unknown ! So far the selectivity, filtering and sensitivity seem to be good but I will have a lot more to learn about it. It has been a long day so that will have to do for now. Verdict : very pleased so far. Thomas. I am thinking of buying the CR1-A and have already downloaded the instruction book. I am aware that the battery used is a 18650, and I have a spare. The book does not mention how to change the battery. Is there a “door” or do the covers have to be removed to find the battery ? There is no door–you would have to remove either the top or bottom cover. I’ve never done this before, though. It might be worth contacting Don at CommRadio and asking him. I’m sure this has come up before. Thanks Thomas, this is what I suspected. I was hoping for a quick battery replacement so I could use one battery whilst remotely charging the other. Never mind, I will be ordering the AC power supply with the radio. The importer (UK) is offering a small Icom unit which I trust will be free of the dreadful RFI hash that many small units produce. Sure, Mick! Your comment arrived at the right time. Just settling in after several weeks of travel. I’m terribly behind on correspondence, actually. I think you’ll be favorably impressed with the run time that battery will provide. It’s also a huge bonus that the CR-1 series accepts such a wide range of voltages–I’ve charged mine from a portable PV system, my car’s 12V plug, my laptop, my smart phone charger–pretty much anything that puts out voltage! Get a little portable battery pack and that–in essence–will also serve as spare power. Smart of you to get a regulated PS! Thomas, thanks for your comments. I have ordered the Comm Radio now for delivery later this week. I’m traveling a lot during the year (over 80% of my time). I can carry only one radio plus a longer whip and maybe a random wire with me. Currently I’m using a 7600GR and PL-660. Which one you recommend CR-1a or a KX-3 to enjoy some SW listening in a hotel room? In many senses the CR-1a is more portable than even the KX3. Since it’s RX only, its internal battery will run for hours and change charge from a wide array of voltages. If you wanted to play ham radio in travels, then the KX3 would be the better choice, of course, but you would need to sort out a good battery charging system or external battery pack. My main concern would be your antenna. Hotel rooms are so noisy (with RFI) I’m not sure how pleased you would be with a wire antenna. It’s only available through eBay via a seller in Australia. Perhaps he’ll comment on this post as well. 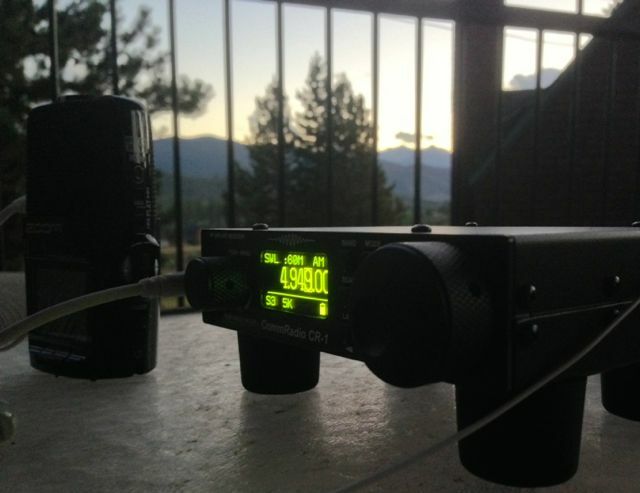 Has anyone done any DXing on the FM band with this radio? 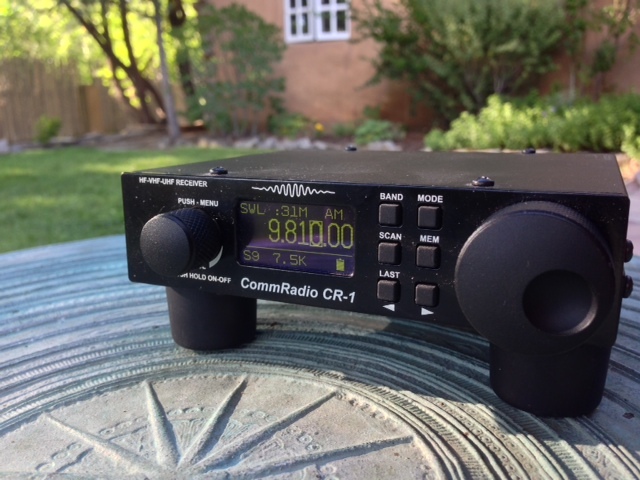 Well…..I am now the proud owner of the Commradio CR1-a. (I took Thomas’s advice and kept the Drake too !) The CR1-a is a seriously cool radio. I have had it for 24 hours and have no regrets. It does exactly what it is supposed to do and it does it well. It’s a keeper. Very low noise floor, which goes away further when you settle on a station with sufficient signal strength to allow the software to do its job. Intuitive controls and great audio. So far so good !!! How is the audio on this radio, from the internal speaker, for general listening — for broadcast FM, as an example? I wonder how this compares to the Sangean ATS-909x as a reference. I don’t have an ATS-909X here for comparison, but I think the CR-1a audio would be similar. The CR-1a internal speaker is designed for clarity–which it achieves quite well. The ATS-909X might have a slight edge in terms of bass. Both are quite good, though. I am considering selling my Drake R8B and replacing it with a CR1-a. My interest is primarily Amateur Band monitoring at night, and throw in a little SW, radio Havana, Cuba, Arnie Coro etc. The CR1-a seems like a great replacement and would free up bedside-table space. I love owning the Drake, and that is making it a difficult choice. Any thoughts ? Oh boy, Michael. What a difficult question you ask. It would be very difficult for me to sell the Drake R8B. The CR-1a is an amazing radio, but the R8B is a classic and more versatile as a tabletop. Of course, you could probably sell your R8B for much more than you originally paid for it. There’s a reason that radio has a cult following! It’s a benchmark. I’m pretty sure that was the answer I was hoping for !! Now…..where to scrape up $600 from…hmmmm. Hi there. Thanks for the information. I was considering one of these little CR-1As and was also seeing the older Lowe 150 but it is a little dated. You said you used the Lowe in the past. How did you like it and how does it compare to the CR-1A? I was considering picking up a Lowe but they are like $400-500 on ebay which is really close to the $600 CR-1A price tag. Does not make sense to buy the Lowe unless it is a better receiver. Your thoughts would be very much appreciated. Thanks! As much as I love the simplicity and audio from most of the Lowe line of receivers, if I faced the choice you’re making, I would go with the CommRadio CR-1a. For just a bit more than the Lowe, you would get much more flexibility. The CR-1a also has a simple front panel and is easy to use. With the built-in battery option, it’s incredibly versatile and travel-friendly. It’s also engineered to mil-spec standards. The negative with getting an older radio like the Lowe is that you run the risk of needing an obsolete part for potential repairs. With that said, Lowe receivers tend to last and, as you’ve noted, seem to hold their value well. Cool, Tom! Thanks for letting me know. I was curious about it and checked to see if there are telescoping antennas for the CR-1. Living in a rental home, I don’t have much rights for rigging antennas outdoors (which is why I only have a simple wire antenna indoors along with whip reception). I’ll take your word on it about whip antenna reception. It seems you may have help me save some money for now, but it’s something I may revisit years in the future. Besides, I haven’t done much SWLing lately, thanks to stations shutting down or moving online & working at night. But I still try to listen to the emerging stations like WRMI and The Mighty KBC. How would this radio compare to the Tecsun PL-660? I know that it’s like comparing apples to oranges, but I am curious about its performance. I would like to save up for a rig like this if it exceeds expectations. There’s only so much antenna options on the PL-660. You’re right–it’s an apples to oranges comparison. If I had the CR-1 hooked up to a mediocre antenna, the PL-660 very well may outperform it in some situations. But with a good external antenna, there would be no comparison. I regularly have the CR-1 hooked up to a huge horizontal delta loop at home (where I have very little RFI) and it will hear stuff that doesn’t even register on the PL-660. But if I hook a telescopic whip on the HF antenna port on the CR-1–one the same size as that of the PL-660–I’d be willing to bet that the PL-660 would be more sensitive. The CR-1 is designed to be used with external antennas. While traveling, I had the CR-1 hooked up to two decent, resonant RX antennas outdoors. When I used one of my other portables, it was when I was on the go or did a little impromptu scanning. In that situation, did you ground the PAR antenna at the unun, or did it do OK ungrounded? I have been eyeing the CR-1a, so it is nice to hear you’re happy with the CR-1. It performed very well; well enough that I’m considering installing it permanently at the house and will certainly ground it there. I’m working up short posts on the PAR and the NASA antennas I used on this trip.